Karina's Kreations: Stampin'Up All That You Are Beginner Stamping Card! Stampin'Up All That You Are Beginner Stamping Card! I created a card today that is perfect for new stampers using the All That You Are stamp set. The card uses two colors of ink and three colors of card stock. If the new stamp stamper doesn't have access to a big shot die cutting machine, they can cut a rectangle inside of using the Oval Layering Framelit Dies. 1. Cut a piece of 4-1/4" x 11" piece of Gorgeous Grape card stock and score at 5-1/2". 2. 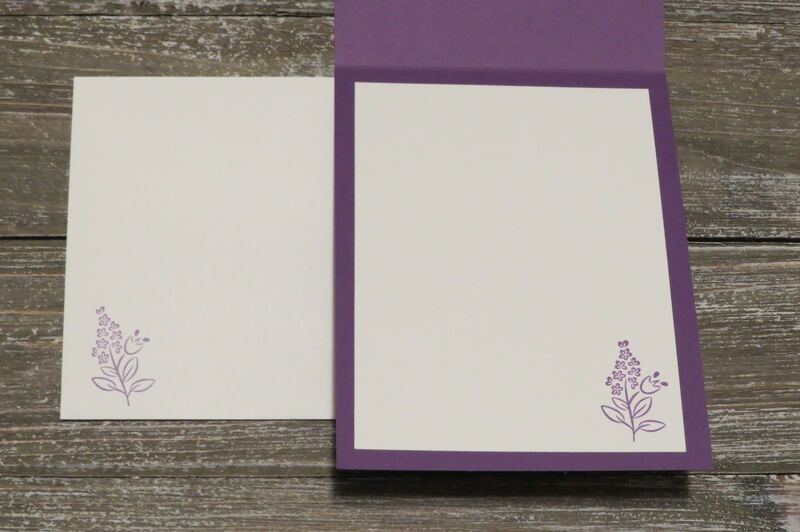 Randomly stamp the flower image on 3-3/4" x 5" Whisper White card stock using Gorgeous Grape ink. 3. Stick to 3-7/8" x 5-1/8"Basic Black card stock and then to the card base. 4. 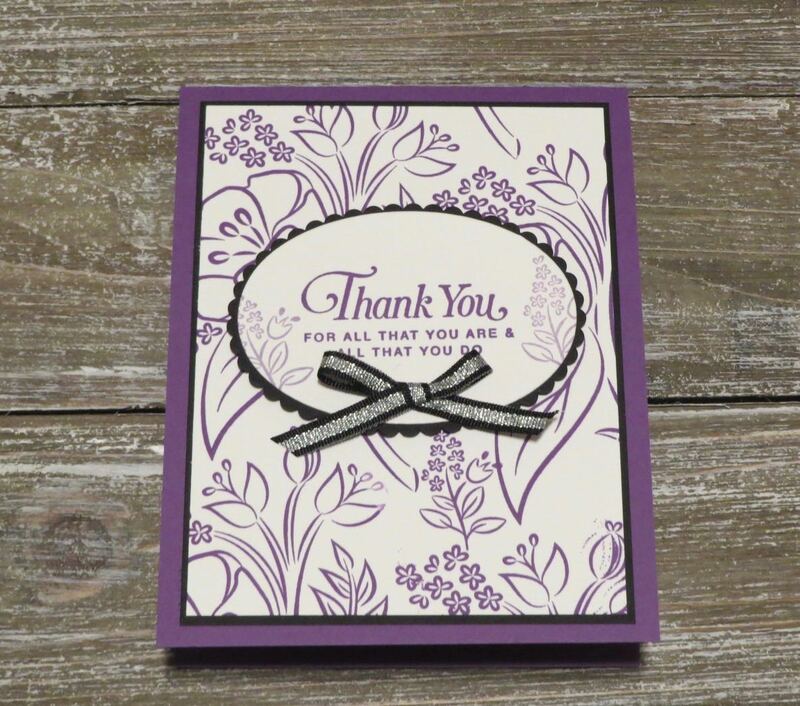 Stamp the sentiment with Gorgeous Grape ink on 3-1/4" x 2-1/4" Whisper White card stock cut out with an oval framelit. Stamp the saml flower using Highland Heather ink. 5. Cut out a coordinating scallop oval framelit from Basic Black card stock and attach the ovals together. 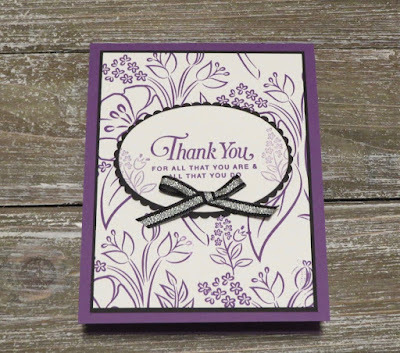 Adhere to the card using a Stampin' Dimensional. 6. Tie a bow from Striped Metallic Ribbon and attach to the card using a glue dot. 7. Stamp the small flower on 3-3/4" x 5" Whisper White card stock using Highland Heather ink and stick to the inside of the card. You will find a shopping list below- click on any of the products to go to my Online Stampin'Up stamping store.